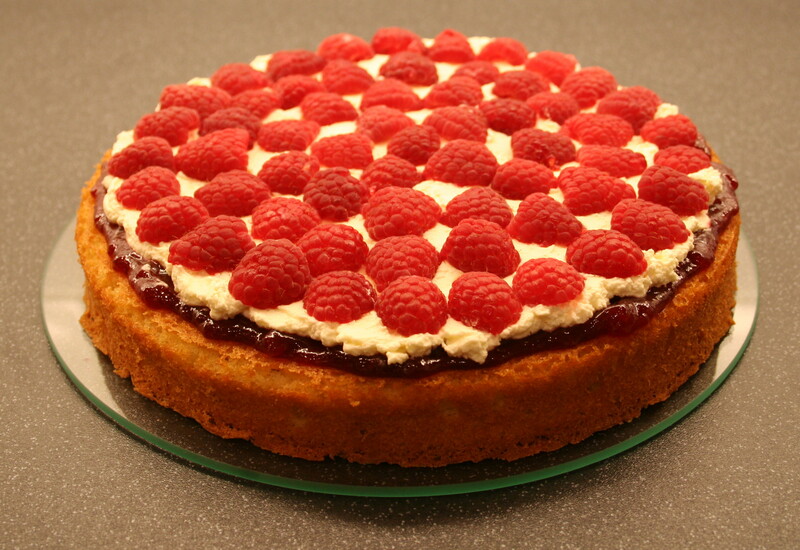 And so this is my Jubilee offering – a cake that epitomises everything that is quintessentially English – light vanilla sponge, summer raspberries and whipped cream. Note: I only used 150ml of cream when I made it – and it definitely wasn’t enough – the cream should ooze out of the sides of the cake in a thick layer. 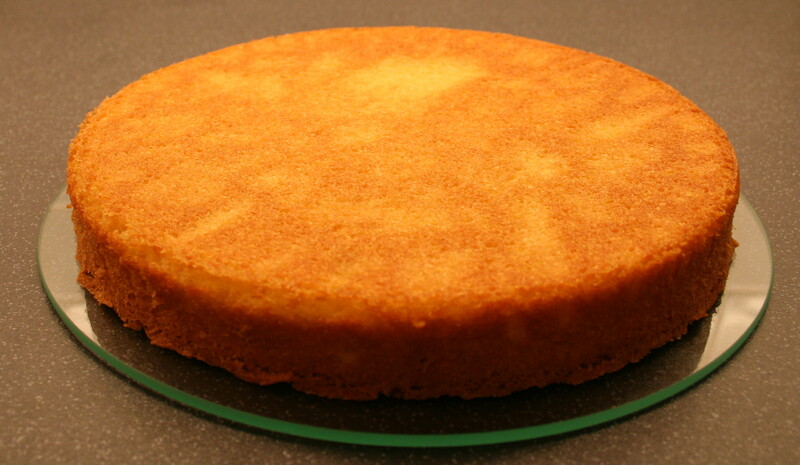 Butter two 8 inch (20cm) cake tins and line the bottoms with grease-proof baking parchment. Preheat the oven to 190°C (170°C in a fan oven). Weigh the eggs and set them aside – mine weighed 265g. 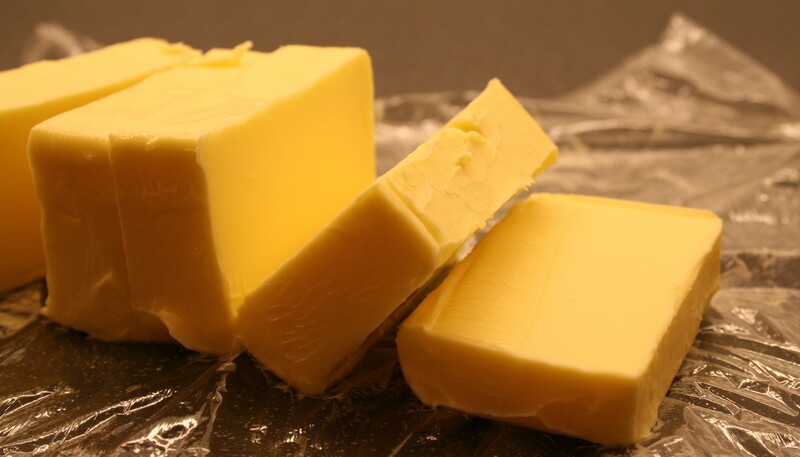 Weigh out the same amount of butter, cube it and place in a bowl, and the same amount of caster sugar and place in the bowl with the butter. Weigh out the same amount of flour and set it aside. 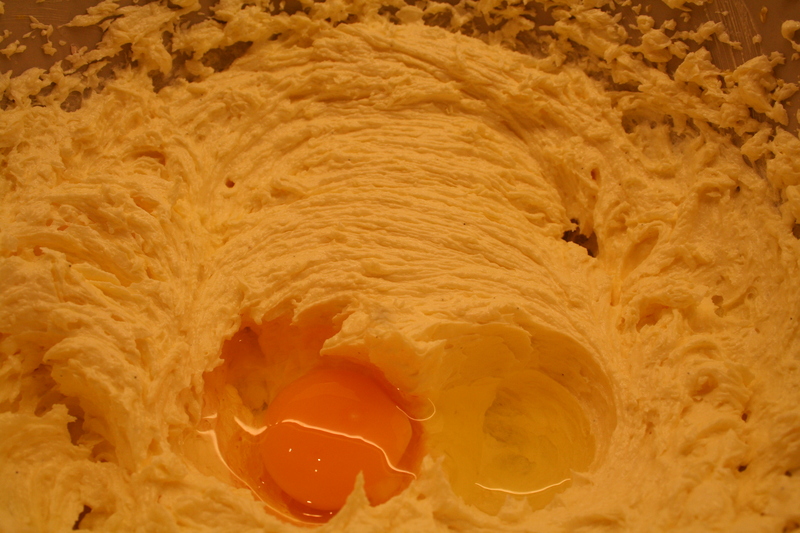 Add one egg at a time, ensuring it is fully incorporated before you add the next one. Add the vanilla extract and beat well. 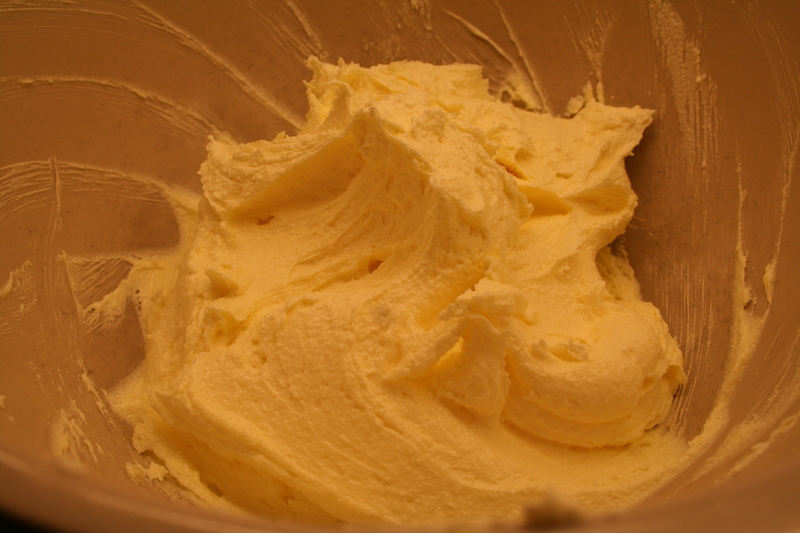 Sift in the flour and fold gently into the mixture. 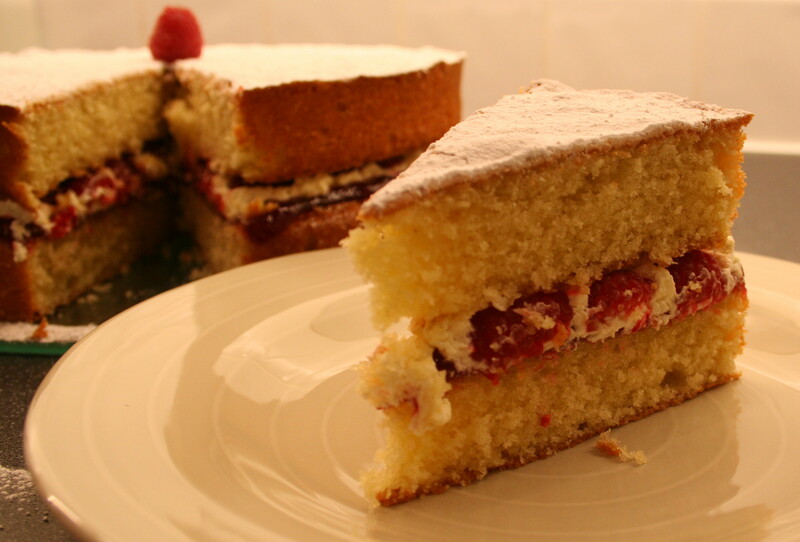 Divide the mixture equally between the two cake tins and spread flat with a spatula. Bake for 20 to 25 minutes, or until golden brown and when inserted a skewer comes out clean. Allow to cool slightly, then turn out onto a rack to cool completely. 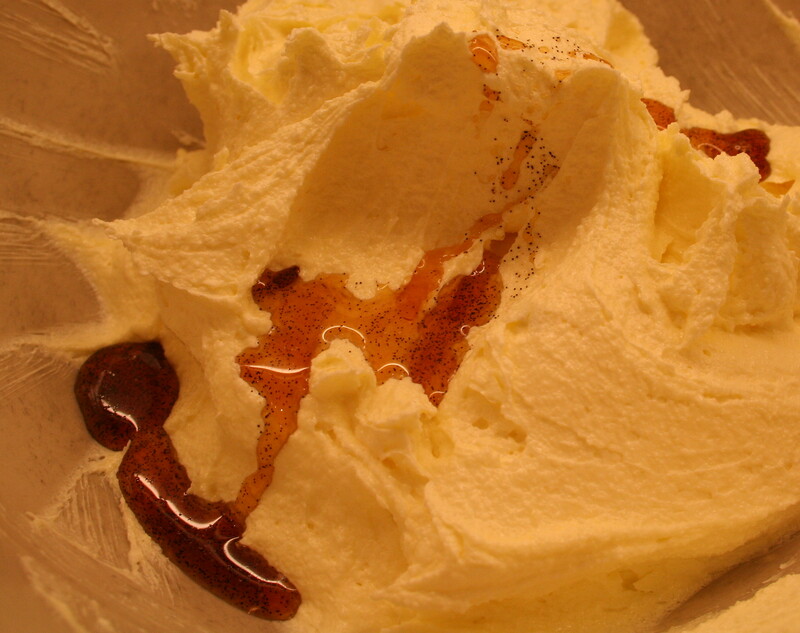 Whip the cream and the vanilla extract until soft peaks form, being careful not to over whip it (although not a disaster, mine was slightly over whipped). 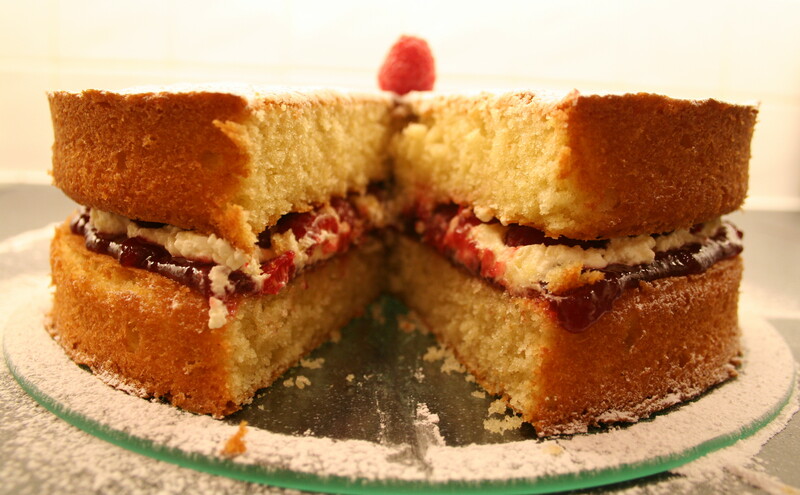 Lay one of the layers on a cake plate and spread the jam evenly over it. Carefully spread the whipped cream on top of the jam. Half the raspberries and layer them onto the cream. 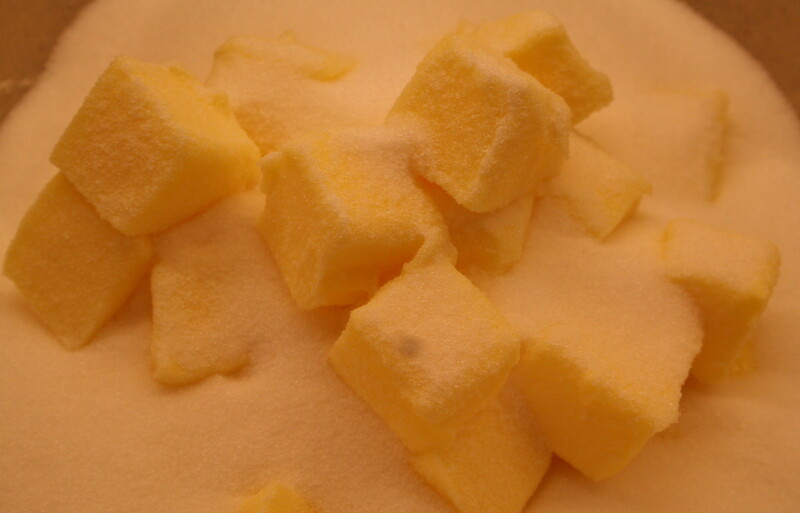 Place the second sponge on top of the raspberries, and dust with icing sugar. 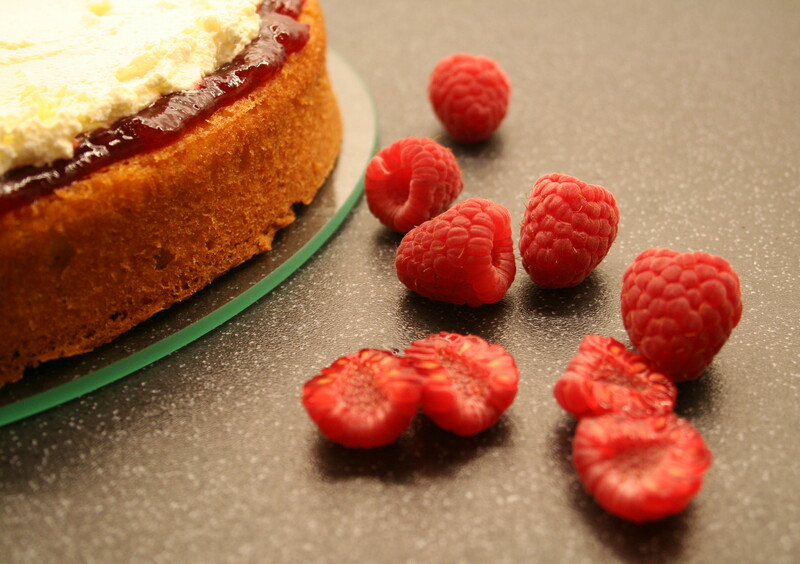 Decorate with any left over raspberries – and serve on a beautiful cake stand. 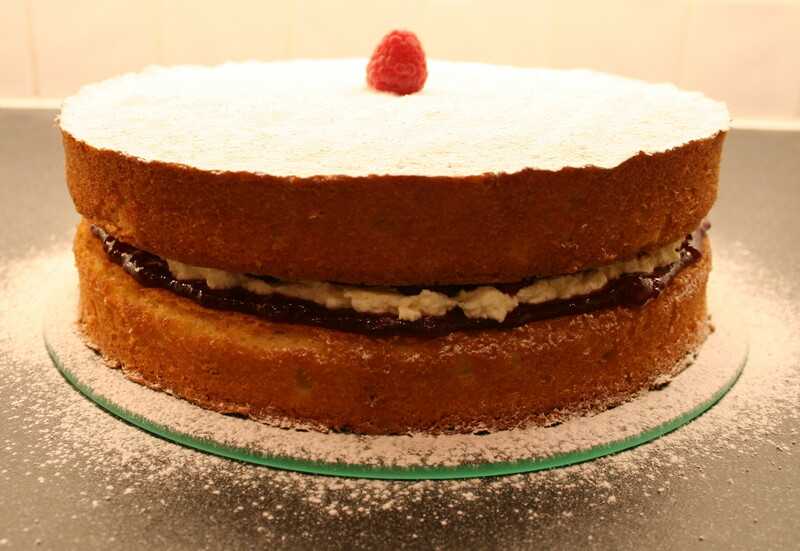 This entry was posted on Tuesday, June 5th, 2012 at 17:42	and tagged with cream, jam, raspberries, raspberry jam, sponge and posted in cake, celebration baking, fruit. You can follow any responses to this entry through the RSS 2.0 feed. Sitting in the arid Karoo in South Africa, I too have been following the Queen’s Diamond Jubilee with amazement at how the British have come out in their millions to celebrate this very amazing monarch and now she has a Jubilee cake!